A local court in Perm, Russia found Vladimir Luzgin guilty of “publicly denying the facts established by the International Military Tribunal for trial and punishment of European Axis countries’ major war criminals”, as well as “disseminating knowingly false information about the USSR’s activities during the Second World War.” In 2014, Luzgin reposted an article on the Vkontakte social network. The court found the repost entitled 15 Facts on Banderovtsy 1Followers of Stepan Bandera (1909-1959), a controversial Ukrainian political activist and leader of the nationalist and independence movement of Ukraine. or What the Kremlin Is Silent About to contain “deliberately false information” about the USSR’s activities during the Second World War, namely that the communists (i.e. the Soviet Union) and Nazi Germany jointly started the war and engaged in close collaboration. According to the Perm court’s verdict, these assertions contradict the facts established by the Nuremberg Trial. The Russian court’s verdict is based on the witness testimony of Alexander Vertinsky, dean of History at Perm Humanitarian-Pedagogical University, and on expert opinion (Russian only) prepared by a group of authors, including Boris Dementyev, professor of Ancient and New Russian History at Perm State National Research University. It is commonly believed that historians’ interpretations of past events have little impact on our daily lives. But Luzgin’s story demonstrates that, by agreeing to promote official ideology in the study of history, historians can dramatically affect someone’s life today. A federal law passed on 5 May 2014 in Russia introduced a new provision in the Criminal Code, namely article 354.1, making it a criminal offence to engage in what it calls “rehabilitation of Nazism.” But what exactly is meant by this weighty phrase? In dry legalese, the law describes it as public denial of any facts established by the International Military Tribunal in Nuremberg, justification of crimes defined in its judgment, and dissemination of knowingly false information about the USSR’s activities in the Second World War (paragraph 1 of the article), and also dissemination of explicitly disrespectful information about Russia’s official “days of military glory” and memorable dates associated with the defence of the Fatherland. This includes desecration of symbols of Russia’s military glory (paragraph 3 of the article). When the bill was proposed, its explanatory note said that the denial of facts established by the Nuremberg Trial could manifest itself as approval of aggressive Nazi policy, or denial of Nazi crimes. Let us first consider the provision concerning the denial of facts established by the Nuremberg Trial and justification of crimes defined in its judgment. 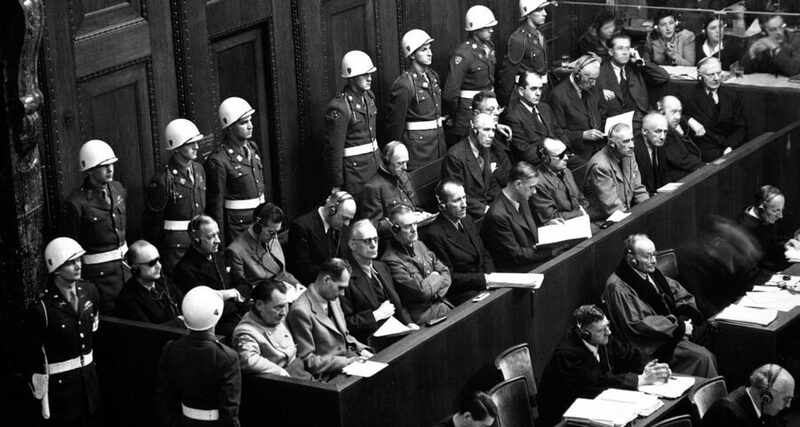 What has been established in the Nuremberg Trial? Its judgment describes events which occurred over an extended period of time, starting with the emergence of the Nazi Party. Following the logic of the Russian Criminal Code, we assume that the historical facts described in the Nuremberg Judgment may not be questioned under threat of criminal liability. The Perm regional court states in its verdict that the article reposted by Luzgin contains information about collaboration between communists and Germany in triggering the war. In its pertinent sections, The Planning of Aggression; The Invasion of Austria; The Seizure of Czechoslovakia; The Aggression against Poland; The Aggressive War against the Union of Soviet Socialist Republics, the Nuremberg Judgment describes the actions of the German leaders which evidence their aggressive intentions and preparation for aggression during this period. The key controversy among historians regarding the pre-war period concerns a number of its turning points, notably the Munich Agreement of 1938 – dubbed as collusion in Russia – and the Molotov-Ribbentrop Pact of 1939. The fundamental, 12-volume Soviet History of World War II, 1939-1945, 2History of the Second World War, 1939-1945, in 12 volumes. –M. : Voenizdat, 1973-1982. Vol. 2. describes the Munich Collusion as “one of the most shameful acts in the international politics of capitalist powers” aimed at triggering Nazi Germany’s aggression in the East. The Molotov-Ribbentrop Pact and its secret protocol are not only controversial with regard to their exact interpretation but also to very existence of the Protocol. While the Soviet Union denied for a long time the existence of this secret protocol in the Non-Aggression Pact, those who asserted the opposite were not prosecuted. Understood literally, it means that the Russian law should not punish anyone for saying that the Munich Agreement was directed against the USSR, nor indeed for saying that the USSR was preparing to attack Nazi Germany. The Nuremberg Tribunal did not explicitly rule out the possibility that such an attack was contemplated, but only refused to believe that the Nazi leaders honestly considered it a threat as they were preparing for war. By Russian law, any facts already established by a court do not need to be proven again and cannot be disputed in other proceedings, at least in regard of the same persons and grounds (article 61 § 2 of the Russian Civil Procedure Code). However, article 354.1 of the Criminal Code introduces criminal liability for denying the facts already established by a court. Admittedly, the Nuremberg Tribunal is a very special court, and if its judgment is accepted as indisputable truth and made part of the country’s legal system, every member of the legal profession must have adequate knowledge of this document as an important source of law. In particular, they need to understand the logic by which certain members of Hitler’s SS were convicted as criminals, while others were not. They also need to be aware of the difference between facts and circumstances which have been proven and those which have been only mentioned in the Nuremberg Judgment, such as the Molotov-Ribbentrop Pact or the Katyn massacre. The Perm regional court states in its verdict that the assertion of close collaboration between communist and Nazi regimes contradicts the Nuremberg Judgment. Since the reposted article describes the events at the beginning of the war and specifically the USSR and Germany’s cooperation before 22 June 1941, the statement in question does not deny the facts established by the Nuremberg Tribunal, as its judgment says that the USSR was in compliance with the Molotov-Ribbentrop Pact. Second, let us address the issue of spreading deliberately false information concerning the USSR’s activities during the Second World War. When prosecution is based on this ground, the Russian court no longer needs to show contradictions between the statement in question and the Nuremberg Judgment; instead, the statement must be proven false. Enter the historians. According to the expert opinion, the phrase “the communists and Germany jointly sparked off the Second World War” disseminates deliberately false information about the USSR’s activities during the Second World War. If follows from the verdict in Luzgin’s case that his prosecution is based on the error in the date of the Soviet attack on Poland: the correct date is September 17th, not September 1st, 1939. So Luzgin has been punished for his otherwise logical conclusion – but following from the erroneously assumed date of the USSR’s attack on Poland – that the USSR jointly with Germany started the Second World War, while in fact, the USSR entered the Second World War after it had already been started by Germany. One can only infer that it’s Luzgin’s poor knowledge of historical dates which cost him criminal prosecution and a 200,000-ruble 3Approximately EUR 3,300. fine. It could be argued that the new reality the Criminal Code article creates, and the Perm court’s ruling, can discourage further discussion of the USSR and Nazi Germany’s collaboration at the beginning of the Second World War. But earlier historical periods can still be freely talked about. It is therefore permitted to mention the training of German pilots in Soviet military schools before 1 September 1939, but not the joint military parade in Brest on 22 September 1939. It should be legitimate also to mention that Germany was trading with the U.S. at the time, since this fact is not addressed in the Nuremberg Judgment. November 4 – Day of National Unity. December 9 – Day of Heroes of the Fatherland. What exactly can be considered explicitly disrespectful as far as military glory and memorial days are concerned? While no legal comments are available so far, perhaps historians should be particularly cautious while debating, for example, whether the Battle on the Ice was won by Suzdal and Mongolian troops or whether this battle ever occurred in the first place. It remains to be seen whether New Chronology by Anatoly Fomenko describing the Kulikovo battle as “a battle of Volga and Siberian Cossacks led by Dmitry Donskoy against the army of Polish and Lithuanian Cossacks led by Mamai” could result in prosecution. 4G.Nosovsky, A.Fomenko. Rus’. The Genuine History of the Great Russian-Tatar Medieval Empire. Moscow, Astrel/AST, 2009. P. 223 One can only sigh with relief and thank the legislators for not specifying who won the Battle of Borodino on September 8, because Russian historians can still discuss the matter with their French colleagues who believe that the battle was won by Napoleon. In addition, anyone discussing Russian history should not forget about criminal liability for “desecration of symbols of military glory.” Russians are no strangers to black humour and cynical jokes, particularly where they witness government-imposed “patriotism” manifested in ill-conceived initiatives and artistic disasters. However, popular humour can trigger criminal sanctions. Thus, the Syktyvkar city court upheld the magistrate’s decision to impose a 200,000-ruble fine on the local 7X7 webzine found guilty of insulting the local Eternal Glory Memorial by referring to it with its popular nickname “ladies roasting a crocodile.” The Eternal Glory Memorial was opened in Syktyvkar in 1981 to honour the 60th anniversary of the Komi Autonomy. The sculptural composition includes the Eternal Flame commemorating soldiers from Syktyvkar killed in the Second World War. The monument features three mourning women representing the soldier’s mother, wife and daughter: the woman in the centre holds a cedar branch symbolising strength and longevity. The webzine editors continue to insist that the phrase which was found offensive “is a set expression established in speech patterns virtually since the time the memorial was first opened.” So apparently, it is still okay to nickname monuments to Lenin Chupa Chups (Yaropolets) or Dead Head (Ulan-Ude), but echoing some aesthetically-sensitive people that say that the statue of Marshal Zhukov’s horse outside Red Square more resembles a dog, can earn you a criminal record. The Russian Supreme Court upheld the Perm regional court’s verdict in Luzgin’s case. Luzgin has since fled to the Czech Republic. As it is now a criminal offence in Russia to spread “deliberately false information about the USSR’s activities during the Second World War,” historians are faced with the challenge of clearly defining what exactly the USSR was doing during this period and what can be considered deliberately false information about its activities. Yet one must be able to study history and feel safe in doing so. Article 354.1 of the Russian Criminal Code effectively censors historical debate. Its enforcement implies that judges should not only assess the evidence available or even the appropriateness of certain actions in terms of public morality but also know history at a deeper and more sophisticated level than they could ever imagine, as the source of law is an historical document which cannot be subjected to legal revision or correction. In referring to this document in their judgments, courts need to be aware not only of what it contains, but also of what has intentionally been left out, and why. As in Luzgin’s case, judges will need to refer to qualified historians for expert opinion. But how prepared are historians to having their expertise used as an instrument of repression against their academic opponents? 1. ↑ Followers of Stepan Bandera (1909-1959), a controversial Ukrainian political activist and leader of the nationalist and independence movement of Ukraine. 2. ↑ History of the Second World War, 1939-1945, in 12 volumes. –M. : Voenizdat, 1973-1982. Vol. 2. 3. ↑ Approximately EUR 3,300. 10th year student of the Perm High-school No. 9, volunteer for the Perm Regional Human Rights Center.